Lets begin with acknowledging what a great line-up this years MAMI has brought to us. There are 175 films to watch. Even if you try to watch as many films as humanly possible, you could only see four films a day. If you are a insane person maybe few days you will end up seeing five. For every film you will watch you will be missing eight other films. See how important that decision is to watch a film? Many of you will follow lists published in the last few days. MFC, Pandolin, MadaboutMoviez. Each of those lists are excellent. But I’m giving you an alternate strategy: Don’t watch anything that will be available to watch later easily, in theaters, iTunes, streaming. This will likely eliminate more than half the films in the list you made in the last couple of days. It is controversial when I say don’t stand in line for 45 mins to watch Herzog’s Lo and Behold, but I believe that is the smart way to navigate a huge festival like this. So lets go through DAY 1. What better way to start the festival than by watching Kelly Reitchard’s CERTAIN WOMEN. She is one of my favorite indie filmmakers from US. In fact there is a Indian film in the festival that is inspired by her second film OLD JOY. But every film of hers has ended up at Netflix at some point. I would recommend The Road to Mandalay instead. Then you are probably thinking about missing NERUDA for the conversation with Zia or vice-versa. Pablo Larrain is probably the hottest director of 2016. He seems to be a master of historical films. Just watch the trailer of JACKIE. So there is a very good chance that NERUDA will play in theaters followed by streaming on Netflix. The movies in that time slot that looks interesting are THE WAR SHOW and WHITE SUN. In that same time is SWISS ARMY MAN. It is one of my favorite films of 2016. 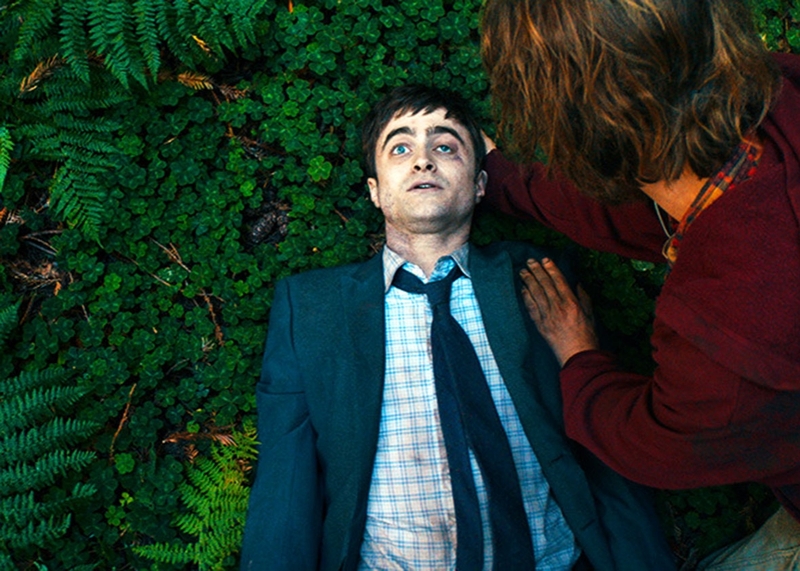 I feel Daniel Radcliffe should get a Oscar nomination just for accepting this crazy role. So I think the chances of being able to watch this later are pretty high. Its not even six hours into the festival and we have to deal with so many choices. Imagine for the rest of the 6 days. For rest of Day 1, these are the movies that I’m going to watch – OBSCURA ANIMAL. AQUARIUS, ENDLESS POETRY and LOEV. THE CINEMA TRAVELLERS has gotten some great buzz in festivals abroad. Then there is GOODBYE BERLIN. Directed by one of my fav filmmakers in the world. I’m conflicted about this one. I badly want to see it but also know that it will not be difficult find it on streaming services next year. CECILIA looks like interesting documentary. Documentaries are so rare in India. The films I will not even try for the reason stated above: Werner Herzog’s LO AND BEHOND, NEON DEMON, A DEATH IN THE GUNJ, THE LOVERS AND THE DESPOT. These films will be sold out no matter what. I was planning to write a longer article covering all 7 days, but i don’t think I have the time for it. You get the idea. See you out there. And hey in case you haven’t still made up your mind over the first set of films to watch then take a look at these trailers as they might help you. ← Mumbai Film Festival 2016: Day 3 Must Watch!